January 29, 2016, 5:40 p.m.
Poorer whites are often assumed to hold more negative opinions of other racial groups than wealthier whites, but the latest research from YouGov, shows that class may not play an important role in white Americans&apos; racial attitudes. 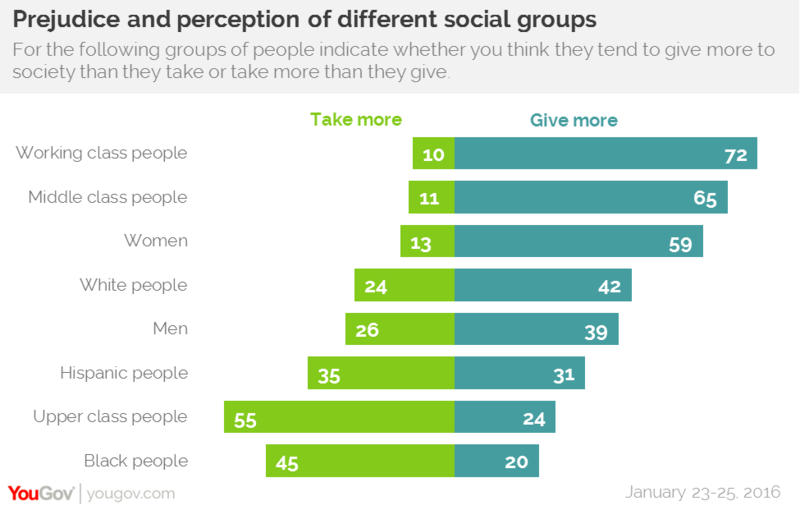 Respondents in a recent YouGov survey were asked whether they think that various groups of people give more to society than they take, or whether they take more than they give. Working class people come out on top in the eyes of most Americans if you look at society as &apos;givers&apos; and &apos;takers&apos;. 72% of Americans say that working class people give more than they take, while only 10% say that they take more than they give. Middle class people (65%) and women (59%) are the only other groups which most people describe as &apos;givers&apos;. Upper class Americans (55%) are the most likely to be described as &apos;takers&apos;. Apart from the upper class, only two groups tend to be seen as &apos;takers&apos; rather than &apos;givers&apos;: black Americans and Hispanic Americans. 45% of the country views black Americans as &apos;takers&apos;, while only 20% see them as &apos;givers&apos;. 35% say that Hispanics are takers and 31% say that they are givers. 50% of white Americans say that blacks take more than they give, while 16% say that they give more to society than they take. 44% of Hispanics say that black Americans take more, while 45% of black Americans say that they give more than they take. Respondents were asked to identify which class they consider themselves. 45% of white Americans identify as working class while 52% identify as middle class. There is very little difference between working class whites (49%) and middle class whites (51%) in how likely they are to view black Americans as &apos;takers&apos;. Ideology, however, has a significant impact. 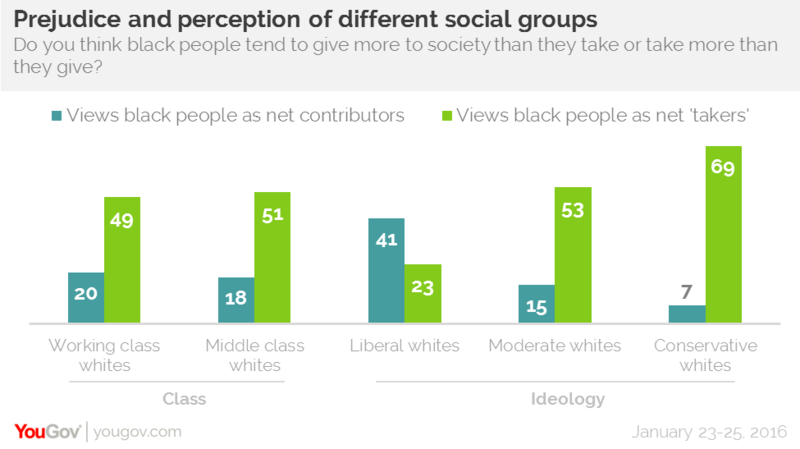 Liberal whites tend to say that blacks give more than they take, with 41% of white liberals, something working class white liberals also agree with. Most white moderates (53%) and white conservatives (69%) say that black Americans take more than they give. 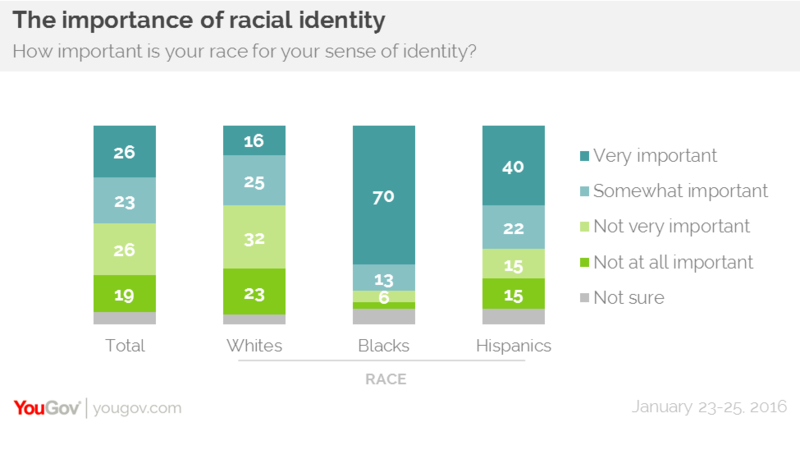 White Americans (38%) are much less likely than either black Americans (83%) or Hispanics (62%) to say that their racial identity is important to them. There is very little difference between working class (38%) and middle class (40%) whites on this issue, though conservative whites (44%) are slightly more likely than liberal whites (37%) to say that their race is important to them. Most white Americans (62%) say that your class has a bigger impact on your life in America than your race (19%), something black Americans definitely do not agree with. 67% of black Americans say that race is more important than class, something only 23% disagree with. Hispanics are split 41% to 41%.